Our advance continued past Louhans; past Arbois, where Louis Pasteur experimented; past Avenne, and swept to the Doubs River near Besancon. The 36th Reconnaissance Troop, feeling out the river bank found all bridges blown, but located one only half destroyed. Doughs were sent over to secure the far side, while 111th Engineers immediately went to work. In 22 hours, engineers fashioned a 120-foot span to the other bank as steady autumn rains began to fall. 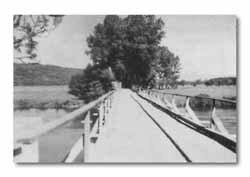 Troops and armor moved across the completed bridge, forging onto the natural retreat route of the Germans heading from southwestern France to Belfort Gap. Nearly a thousand prisoners were taken in the first days action. In the Besancon area, the 143rd RCT captured a fuel dump containing 700,000 litres of 80-90 octane gasoline and 4,000 gallons of alcohol. THE 111th ENGINEER BATTALION worked day and night to complete this timber trestle bridge across the Doubs in 22 hours. Then tanks and infantry poured across to continue the chase (below). At Vesoul the Germans tried hard to make a stand; there was bitter house-to-house fighting. 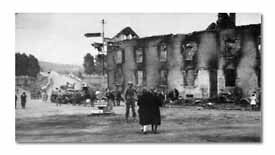 With the 1st and 3rd Battalions abreast, the 141st attacked the town in conjunction with 3rd Division elements on its right. The 1st Battalion on the left was hit by heavy artillery concentrations as it jumped off and the Battalion Commander, Lt. Col. William A. Bird, was wounded. Reorganization delayed its advance. The 3rd Battalion on the right pressed over a canal and into Vesoul to engage the enemy in house-to-house fighting. 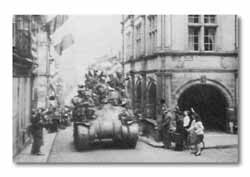 After nine hours of stubborn battling, resistance was overcome and the 141st moved into the town.